This article is about Costa Rica's men's national football team. For the women's team, see Costa Rica women's national football team. The Costa Rica national football team (Spanish: Selección de fútbol de Costa Rica) is administered by the Costa Rican Football Federation (FEDEFUTBOL), the governing body for football in Costa Rica. They have been a member of the International Federation of Association Football (FIFA) since 1927, a member of the Confederation of North, Central American and Caribbean Association Football (CONCACAF) since 1961, and a member of the Central American Football Union (UNCAF) since 1990. Costa Rica is the most successful national football team in the history of Central America. They have won three CONCACAF Championships (1963, 1969 and 1989) and a leading with eight championships in the Copa Centroamericana and its predecessor. Costa Rica is the only national team in Central America to have played in four FIFA World Cup editions. Costa Rica's national football team has the all-time highest average Football Elo Ranking in Central America with 1597.1, and the all-time highest Football Elo Ranking in Central America, with 1806 in 2014. Since the late 1980s, the team has continuously been visible as a solidly competitive side, with a prominent performance in the 1990 FIFA World Cup in Italy, making it to the knockout stage in their debut after finishing second in their group during the first phase, below Brazil. They also managed to qualify for the 2002 and 2006 FIFA World Cups. In 2014, Costa Rica made their best performance in history by finishing first in their group that consisted of three former World Cup champions: Uruguay, Italy, and England. During the Round of 16 they defeated Greece 5–3 via a penalty shootout after a 1–1 draw. Reaching the quarterfinals for their very first time the "Ticos" were defeated by the Netherlands also in a penalty shootout (3–4) after a scoreless draw on 5 July. Costa Rica has a long-standing football culture and tradition. The national team made its debut in the Independence Centenary Games held in Guatemala City in September 1921, winning their first game 7–0 against El Salvador. In the final, Costa Rica defeated 6–0 Guatemala to claim the trophy. The football team of Costa Rica has been characterized above all by its regularity over the years. Well remembered is the selection of this country formed in the late 1940s acquiring the nickname of "The Gold Shorties". Throughout the '50s and '60s, they were very much the second strongest team in the CONCACAF zone behind Mexico, finishing runners-up in World Cup qualifying in the 1958, 1962 and 1966 qualifiers. Stars of the side during this period were Ruben Jimenez, Errol Daniels, Leonel Hernandez and Edgar Marin. However, at the end of the '60s their fortunes would decline as other teams in the region such as Guatemala, Honduras, El Salvador, Haiti, Trinidad & Tobago and Canada came to the fore. Although the majority of these participants have been short on points in their World Cup performances. During the 1970s and most of the 1980s, the Costa Rican team went unnoticed, and was absent from World Cups. Costa Rica failed to make the final round of CONCACAF World Cup qualifying rounds until the 1986 qualifier. Currently its historical topscorer is Rolando Fonseca with 47 goals. Costa Rica participated in 2 straight Summer Olympic Games, in Moscow 1980 and in Los Angeles 1984. In 1980, Costa Rica competed against Yugoslavia, Finland and Iraq, in Group D, losing all 3 games 2–3, 0–3 and 0–3 respectively. Los Angeles saw Costa Rica's first win in a worldwide international participation. Again in Group D, the Ticos played against The United States, Egypt and Italy. The game against The US ended in a loss, 0–3. The second game did not see much improvement, 1–4 against Egypt. But in the last game, against an Italian squad that included Walter Zenga, Pietro Vierchowod, Franco Baresi and Aldo Serena, Costa Rica prevailed 1–0, with an Enrique Rivers goal. After a great campaign in the CONCACAF Championship in 1989, Costa Rica got their first ticket to the finals of a World Cup where they made a huge showing after beating Scotland and Sweden in the first round. It all started with a tie against Panama. To advance to the qualifying group stage. Costa Rica suffered against the Panamanians in the first game at Alejandro Morera Soto Stadium in Alajuela, and ended up taking a local one to one tie. In the second game at the stadium Revolution (now Rommel Fernández), with goals from Juan Arnoldo Cayasso and Hernán Medford gave Costa Rica a 0–2 away victory to advance to the group stage. Costa Rica started the group stage with a defeat in Guatemala by 1 to 0. Then beat the same Guatemala 2–1 at home, goals from Róger Flores and Evaristo Coronado. Then Costa Rica beat the U.S. in San Jose by 1–0 with a goal from Gilberto Rodden. Then they lost to the U.S. 1–0 in St. Louis – Missouri. Following this they tied in Trinidad and Tobago 1 to 1, the scorer was Evaristo Coronado. Beat Trinidad and Tobago in San Jose with a goal by Juan Arnoldo Cayasso. A substantial away win was next for the Ticos in El Salvador at the Cuscatlán by 2–4, with goals from Carlos Mario Hidalgo, Juan Arnoldo Cayasso and a double from Leonidas Flores. Finally in the last game a victory over El Salvador in San Jose by 1 goal to 0 signified a trip to the 1990 Fifa World Cup. Pastor Fernandez scored the lone goal. Costa Rica finished first with 11 points in the pentagonal and the United States in second also with 11 points in 8 games respectably both qualifying, but Costa Rica first on goal difference. Mexico was disqualified from this qualifier because of youth player age tampering. In the World Cup finals, Costa Rica was second in their group behind Brazil, but lost in the round of 16 to Czechoslovakia. After its brilliant performance in the Italian summer, the national team failed to qualify for World Cup USA 1994 and France 1998 due to lack of planning and poor results. It was an important and historical moment when, in 1997 Costa Rica was invited for the first time to the Copa América held in Bolivia, Costa Rica also played memorable friendlies including a 5–4 defeat against Uruguay in Estadio Centenario. After the failures in qualifying for the World Cup 1994 and World Cup 1998, the Ticos won the qualification for the World Cup in 2002 held in South Korea and Japan. This included victories against favorites Mexico and the United States. During the World Cup the results were mixed, losing to Brazil (tournament champion) 5–2 (only team to score 2 goals against Brazil at this World Cup), tying with Turkey (third in the championship) 1–1 and beating China 2–0. Costa Rica finished in third place in their group, behind Turkey on goal difference. The match against Brazil is remembered as one of the most exciting matches of the tournament. During the qualifiers, though, Costa Rica started with many ups and downs, first in command of Brazilian coach Gilson Nunes Sequeira and then with another fellow Brazilian naturalized to Costa Rican Alexandre Guimarães. The first group stage began with an unexpected defeat to Barbados 1–2. After this humiliating loss, Costa Rica proceeded to beat the United States at the Ricardo Saprissa Stadium 2–1, with goals from Rolando Fonseca and Hernán Medford. Then they beat Guatemala in the Morera Soto Alajuela by 2–1, with two goals from Paulo Wanchope and defeated Barbados at the Ricardo Saprissa 3–0, with goals from Jafet Soto, Rolando Fonseca and Hernan Medford. After this good run, Costa Rica's level decreased and took a scoreless match against the United States, then lost to Guatemala in Mazatenango 2–1. This result forced a playoff against Guatemala in Miami, Florida. The match was won 5–2 by Costa Rica with two goals from Rolando Fonseca, one from Paulo Wanchope, one from Reynaldo Parks and Jafeth Soto. Costa Rica displayed a fine offensive form with a rather solid front line, thanks to their new coach, Alexandre Guimaraes. This display of football evidenced itself during the final hexagonal round, although it began with a draw against Honduras at the Ricardo Saprissa 2–2, with goals from Rolando Fonseca and Rodrigo Cordero. Then Costa Rica defeated Trinidad and Tobago 3–0 at the Morera Soto. Their only loss in this final round came thanks to the U.S., who defeated Costa Rica 1–0. Afterwards, Costa Rica bounced back with a huge win against Mexico in Mexico city 1–2, which is usually referred as the Aztecazo, with goals from Rolando Fonseca and Hernan Medford. Morale was high after this game, and Costa Rica beat Jamaica 2–1 in Alajuela. Again, Costa Rica came away with an away win over Honduras in Tegucigalpa 2–3, goals scored by Paulo Wanchope, Rolando Fonseca and Mauricio Solis. A crucial away win in Port of Spain against Trinidad and Tobago 2–0, with two goals from Rónald Gómez, meant Costa Rica was just 3 points away from qualification to the World Cup. Costa Rica sealed their qualification to Korea/Japan in an emotional match against the U.S. by beating them 2–0 in the Saprissa, with a double from Rolando Fonseca. The final 2 games were uneventful, as Costa Rica managed a goalless tie with Mexico at the Ricardo Saprissa and defeated already-eliminated Jamaica 0–1, using subs and reserves. Costa Rica finished first in that hexagonal round with 23 points in 10 games. Costa Rica were put in Pot D for the World Cup and were put into Group C with Brazil, China PR, and Turkey. Their campaign started in Gwangju, where the Ticos took down China 0–2. In their second game versus Turkey in Incheon, Costa Rica was losing late in the 2nd half 0–1, only to be saved by a late 86th-minute goal by Winston Parks to end it in a 1–1 draw. In the final group game versus Brazil, Costa Rica fought a 0–3 deficit to go 2–3 early in the 2nd half, only to be shut down by 2 goals in 3 minutes to lose 2–5. As a result, thanks to this loss against Brazil and Turkey's 3–0 victory over China, caused both Costa Rica and Turkey tied with 4 points, but Turkey advanced on the Goal Difference with a +2 goal difference over Costa Rica's −1 goal difference, eliminating the Ticos from the World Cup. In 2006, Costa Rica had an uneven season but managed to make the qualification to the World Cup. On 9 June 2006, Costa Rica made its debut in the opening match in Munich against the host German squad, losing the match 4–2. However, the bad performanc in that game did not translate over to the other games, where they fell 0–3 against Ecuador, and 1–2 against Poland. This time they also started the journey with ups and downs. First in command U.S. coach Steve Sampson, who was separated after qualifying with doubts over Cuba in the preliminary phase, Both these games results were ties. First in Havana 2–2, with goals Douglas Sequeira and Álvaro Saborío, and then in the second game at the Morera Soto in Alajuela 1–1. Costa Rica advanced to the away goals. The Colombian Jorge Luis Pinto took over in the group stage. He began with an unheard of 2–5 defeat against Honduras in Costa Rica. Then they visited Guatemala and lost 1–2. Bounced back against Canada at the Saprissa 1–0, with a goal from Paulo Wanchope. Then a resounding triumph over Guatemala in Tibas 5 to 0, a hat-trick from Paulo Wanchope, single goals from Carlos Hernández and Rolando Fonseca resounding. Vancouver, Canada meant a decent 1–3 win, with goals from Paulo Wanchope, William Sunsing and Carlos Hernández. They pulled a goalless draw against Honduras in San Pedro Sula. Costa Rica advanced to the hexagonal winning their group. In the final round they started with a defeat at the Saprissa against Mexico by 1–2. Paulo Wanchope's goal was not enough. They beat Panama in the Saprissa by 2–1, with goals from Wayne Wilson and Roy Myrie. In Port of Spain tied Trinidad and Tobago in a disappointing scoreless draw. This result marked Pinto's dismissal and the arrival of Alexandre Guimarães. He and the team lost the visit to the United States by 3–0. Guatemala was beaten at the Saprissa 3–2, with goals from Carlos Hernández, Ronald Gomez and Paulo Wanchope. Then lost in Mexico by 2–0. The ticos sank Panama in an away match at the Rommel Fernández 1–3, with goals from Álvaro Saborío, Ronald Gomez and Walter Centeno. Then beat Trinidad and Tobago at the Saprissa by 2–0 with goals from Walter Centeno and Álvaro Saborío. Decisively beating the United States in the Saprissa by 3–0 equaled clinching the selections third World Cup birth. The first Goal was scored by Paulo Wanchope plus a Double from Carlos Hernández. With the ticket to Germany assured then traveled to Guatemala for a 3–1 loss. Roy Myrie scored their only goal. Costa Rica finished third behind the United States and Mexico in the standings. A very strange start for the Ticos. They faced Grenada in the second phase, drew the first leg 2–2, and then won the return by 3–0. In the third phase, forming the Group 3, won all six games played against the teams of El Salvador (1–0 and 3–1), Haiti (3–1 and 2–0) and Suriname (7–0 and 4 -1) in both outward and return. Skipping ahead towards the end of the final phase with Costa Rica achieving 12 points and Honduras 13 points. This meant a dramatic fight for the final spot to qualify for the South African World Cup. Costa Rica had to win their last two games and hope that the selection of Honduras lost. In the first instance they did well. Honduras lost at home 2–3 to the United States. Costa Rica on the other had won 4–0 against Trinidad and Tobago and overtook Honduras in the standings. Honduras closed their matches in El Salvador. However, Costa Rica still needed to give a good showing at the final match in the United States. This was achieved in-part. All went well for the Ticos winning 2–0 at halftime in Washington, D.C.. In the second half the United States scored at the 71st and 95th minutes and the Ticos only finished with a tie. Honduras's, 1–0 victory over El Salvador was devastating. Both Costa Rica and Honduras finished the 2010 FIFA World Cup qualification CONCACAF Fourth Round with 16 points. Honduras slipped into the 2010 FIFA World Cup on goal difference. The Costa Ricans finished fourth in the Concacaf final qualifying round and were sent to a playoff with the fifth seated CONMEBOL team. In the playoff, Costa Rica faced Uruguay. In the first leg in San Jose. The Ticos lost 0–1, the Costa Rians finished the match with ten men on the pitch because Randall Azofeifa was sent off at the 52' with his second yellow card. Goal scored by defender Diego Lugano sky. The second leg, played at the Estadio Centenario in Montevideo. The goals were scored by Sebastián Abreu at the 70' and Walter Centeno 74' and finished in a 1–1 tie. Costa Rica was not able to take advantage of a slight extension of the game or "extra time". Uruguay won 2–1 on aggregate. The fourth-place team in the CONCACAF qualifying fourth round (Costa Rica) played off against the fifth-place team in the CONMEBOL qualifying group (Uruguay). Uruguay won the play-off and qualified for the 2010 FIFA World Cup on 18 November 2009. After failing to qualify for 2010 World Cup in South Africa, the team needed to initiate a new era, based on the combined generational shift with young but experienced talent such as James Douglas McDonald, Keylor Navas, Cristian Bolaños, Randall Azofeifa, Michael Barrantes and of course the very young and upcoming star Joel Campbell. Rónald González was interim contract before hiring in September 2010 of Ricardo La Volpe, whose job lasted only 10 months to be replaced by the Colombian coach Jorge Luis Pinto, in his second chance in front of the national team, with the goal of qualifying for the 2014 World Cup. This era has been characterized by friendlies against the top ranked teams in the world, including world champion Spain, most of them through the construction of the new national stadium. The Ticos' campaign to qualify for the 2014 FIFA World Cup began in June with a 2–2 draw against El Salvador. The Ticos followed this up with a 4–0 win over Guyana with a hat trick by Álvaro Saborío. In September, Costa Rica hit a bump in the road with 2–0 and 1–0 defeats to rivals Mexico, putting the Ticos one defeat away of being eliminated. On 12 October, Costa Rica resurrected their campaign with a 1–0 win against El Salvador with the only goal scored by Jose Miguel Cubero. On 16 October, they finally clinched a final round berth with a 7–0 win over Guyana with goals scored by Randall Brenes, Álvaro Saborío, Cristian Bolaños, Celso Borges and Cristian Gamboa. The fourth round began with a 2–2 draw against Panama. In March, Costa Rica lost 1–0 against the United States in Denver, Colorado. The Costa Rican Football Federation appealed the match due to inclement weather in Denver, but FIFA rejected the appeal as being without basis. Despite feeling aggrieved by the meteorological conditions, Costa Rica would again fall to the US 1–0 in the 2013 CONCACAF Gold Cup that June. On 26 March, Costa Rica won at home 2–0 against Jamaica. In June, Costa Rica won 1–0 against Honduras, tied 0–0 at the Estadio Azteca against Mexico and won at home 2–0 against Panama. In September, Costa Rica won 3–1 against the United States in Estadio Nacional in San José. On 10 September Costa Rica tied with Jamaica. Goals were scored by Randall Brenes at the 73rd minute and by Jermain Anderson at the 90th minute. Despite losing its lead, Costa Rica qualified to the 2014 FIFA World Cup, with two games to spare. After a 1–0 loss at Honduras and 2–1 win over Mexico in October, Costa Rica finished second in the final CONCACAF qualifying round table behind the United States, with five home wins, three draws and two losses. In December 2013, Costa Rica was drawn in Group D against Italy, England, and Uruguay. Costa Rica were widely perceived as minnows who had no hope in a group against three former World Cup champion nations. They were given extremely unlikely odds of 2500 to 1 to win the tournament. Amazingly, they ended up topping the group with two wins against Uruguay and Italy and a 0–0 draw with England. In the round of 16 they beat Greece 5–3 on penalties after a 1–1 draw, seeing them through to the quarterfinals for the first time ever. At the quarterfinals, the Costa Ricans fought the Netherlands to a 0–0 draw after extra time; the game then went to penalties in which Costa Rica lost 4–3 to the Netherlands. After the tournament, Costa Rica rose 12 places in the FIFA World Rankings, reaching 16th place. In an interview by former Federation member Farabundo Fidel Calderón cited their long journey, started in 2007, as the reason of their achievement. The Ticos' qualification for the 2018 FIFA World Cup started with a bye to the fourth round, where they won five games and drew one, letting them advance to the fifth round. There, they finished second behind Mexico. They won four matches, drew another four and lost two. In December 2017, Costa Rica was drawn in Group E against Brazil, Switzerland and Serbia. The team expected to repeat their surprise performance in 2014, due to the fact that many of the key players from the 2014 tournament were set to return. The tournament, however, turned into a surprising nightmare. Costa Rica lost both of their first two games, failing to score a single goal until they drew 2-2 with Switzerland. * Uruguay beat Costa Rica 2–1 in the 2010 CONCACAF vs CONMEBOL play-off. * Ecuador 1993 was the first time nations from outside CONMEBOL were invited. The following players were called up for the friendly matches against Guatemala and Jamaica on 22 and 26 March 2019. Caps and goals as of 26 March 2019 after the game against Jamaica. The following players have been called up within the last twelve months. INJ Withdraw due to injury. WD Withdrew for personal reasons. Costa Rica was the first (and so far the only) Central American football team to win a game at a World Cup tournament. Costa Rica finished in first place in the 1990 FIFA World Cup qualification and 2002 FIFA World Cup qualification with the best punctuation in the history of the Hexagonal (23 pts). Costa Rica is one of two (Cuba in 1938) Central American or Caribbean squad ever to advance to the Quarter Finals of the FIFA World Cup. Costa Rica wears traditionally a red jersey with blue shorts and white socks. Its away kit historically was a Juventus-style Black and White Striped Jersey with white shorts and white socks, due to these colors being the ones of CS La Libertad, one of the oldest clubs in Costa Rica. However, after 1997, the striped kit was replaced by a white kit with blue shorts. Starting in 2015, Boston based sportswear company New Balance will be the kit provider of the national team, taking over for Italian company Lotto. ^ "The Hopes of Central America Rest on a Perpetual Underdog : World Cup 2014: Costa Rica Could Learn From Uruguay's Example". The New York Times. Retrieved 19 December 2014. ^ "When Saturday Comes – Costa Rica goes crazy for the "team of migrants"". Nytimes.com. Retrieved 19 December 2014. ^ Romero, Marcos (28 August 2009). "Costa Rica International Soccer Matches Since 1920". RSSSF. Retrieved 2 November 2010. ^ "¡Aztecazo!". Nación.com. Retrieved 26 March 2017. ^ "U.S. win stands as Costa Rica appeal blown away". CNN. 26 March 2013. Retrieved 19 December 2014. ^ "U.S. downs Costa Rica 1–0 in Gold Cup group stage, advances to quarters". CBSSports.com. Retrieved 19 December 2014. ^ "El éxito de Costa Rica se debe a la paciencia, según exmundialista González". mundodeportivo.com. Retrieved 4 January 2017. ^ a b Luis Fernando Passo Alpuin. 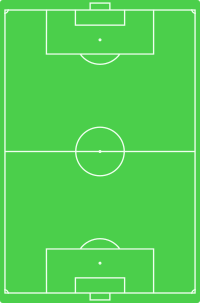 "Costa Rica – Record International Players". RSSSF. Archived from the original on 20 July 2014. Retrieved 4 July 2013. Wikimedia Commons has media related to Costa Rica national football team.